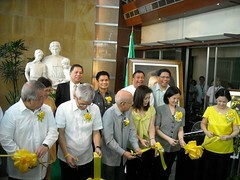 In celebration of the 25th Anniversary of the 1986 People Power Revolution, the memory, and legacy of the late President Cory Aquino, La Salle Green Hills (LSGH), in cooperation with Galerie Joaquin and the Ninoy and Cory Aquino Foundation (NCAF), opened an exhibition of works from top artists last February 24 at the LSGH main lobby. 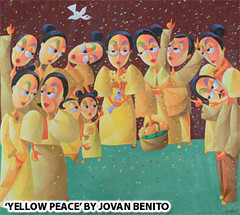 The exhibit, titled “Handog ng Sining: Parangal kay Cory” and featuring pieces inspired by People Power, nationalism, the values and legacy of Cory Aquino, or simply the color yellow, runs until March 10, 2011. Among the artworks assembled for the project are those from National Artist Arturo Luz, Presidential Medal of Merit awardees Federico Aguilar Alcuaz and Juvenal Sanso, Mario Parial, Dominic Rubio, Lydia Velasco, Daniel de la Cruz, Aldrino Abes, Jomar Delluba, Armenius Aralar, Karina Baluyut, Gil Corcuera, Aileen Lanuza, Vincent De Pio, PJ Jalandoni, Henry Ordona, Jaspher Penuliar, Jerry Morada, Juanito Torres and Amador Barquilla. These artists have made their works available for sale to raise funds for the benefit of the One La Salle Scholarship Fund—in celebration of 100 years of La Sallian presence in the Philippines—and of NCAF programs. 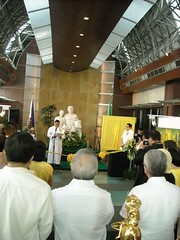 During the opening ceremonies, LSGH presented a replica of the commemorative marker beneath the tally board of the National Movement for Free Elections (NAMFREL) at the St. Benilde Gym—preserving for posterity evidence of the Filipino people’s courageous stand to fight for clean democratic polls in February 1986—to the Aquino family. The Philippine Investment-Management (PHINMA), Inc., through its chair, Oscar J. Hilado, and its president and CEO, Ramon Del Rosario, also turned over to the Aquino family a portrait of President Cory, titled “Woman of the Year” by Jerry Morada. Ballsy and her sisters, Pinky Aquino-Abellada and Viel Aquino-Dee gratefully accepted both gifts on behalf of their family. 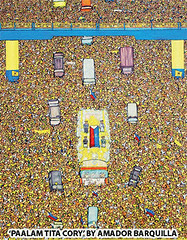 According to Jack Teotico of Galerie Joaquin, “Handog ng Sining: Parangal Kay Cory” includes the touching 60” x 48” oil on canvas work done by Amador Barquilla showing the funeral cortege of President Cory complete with thousands of her beloved countrymen, the Philippine flag and her four honor guards; a unique yellow painting by internationally renowned artist Juvenal Sanso titled “With Undaunted Courage”; a Rubio painting inspired by the courageous Aquino daughters titled “Four Sisters; Mario Parial’s iconic “Homage to Peace”, Jovan Benito’s 48” x 54” painting titled “Yellow Peace”, Jomar Delluba’s “Sikat ng Araw”, and a special sculpture done by La Salle alumnus Daniel de la Cruz, titled “Inang Bayan”. For more information, interested parties may contact La Salle Green Hills at (02) 7213327, Galerie Joaquin at (02) 7239418, or visit www.galeriejoaquin.com. 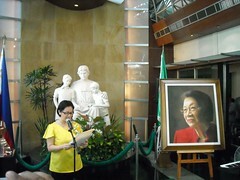 On behalf of the Ninoy and Cory Aquino Foundation and the Aquino family, I wish to thank La Salle Green Hills, the La Sallian community and Galerie Joaquin for this art-oriented tribute to our mother, Corazon Aquino. This is a special occasion for a number of reasons. First of all, as some of you may know, Mom herself had taken an interest in painting after she stepped down from the presidency. Her artistic pastime was more than just a form of therapy; it was an extension of her abiding spirituality. And I have no doubt that she would have deeply appreciated this tribute as a way of peering into the Filipino soul through the eyes of some of our nation’s best artists. Second, it is no secret that La Salle—most especially La Salle Green Hills—holds a special place in her heart. It was here that the true pulse of the people was kept alive after the historic snap elections of February 1986, and since then she has considered this campus a sacred haven for our democracy. It is only fitting, therefore, that, as we commemorate 100 years of La Sallian presence in the Philippines, we have this uplifting venue for helping boost the One La Salle Scholarship Fund. We are grateful to the participating artists for lending their immense talent to make it possible for other gifted Filipinos, who might not have the means, to fully develop their own talents under the guiding light of the fundamental Lasallian values: the spirit of Faith, zeal for Service, and Communion in mission. Finally, as we all know, this occasion is enveloped within our celebration this week of the 25th anniversary of the peaceful EDSA People Power Revolution—better known by its nickname, EDSA 1. After a quarter century, it is not surprising that most young Filipinos today have only a vague notion of what that proud moment in our history was all about. We who lived through those times have the moral obligation to help them appreciate their democratic heritage. This offering from the arts—this Handog ng Sining—is an important part of this process of strengthening that connection between our past and our present. The works of art in this exhibition capture the twin sources of inspiration that led to EDSA 1. Some say that millions of Filipinos had been inspired by Mom’s courage and quiet strength to stand up to the dictator during those perilous times. But it is equally true that Mom drew strength, energy and inspiration from the people as well. By putting their lives on the line for God and country, our people proved what my Dad, Ninoy Aquino, once said—that the Filipino is worth dying for. Those who have known my mother personally would attest to the fact that, given a choice, she would have led a very private life and shielded our family from the limelight after Dad was assassinated in 1983. But when a higher calling beckoned, she found the will to leave her comfort zone to serve the people whom she came to love so deeply—and who loved her back in equal measure. You might say that Mom and the Filipino people brought out the best in each other. Perhaps, it can also be said that, next to God and the Blessed Mother, People Power was the anchor of our mother’s faith. May this wonderful tribute and exhibit help our people, especially the young, not just to remember Cory Aquino but, more vitally, to rekindle their faith and their pride in being Filipino. Animo La Salle! Mabuhay ang Pilipino! Maraming salamat po.